Using observations of Venus performed with an instrument on ESA's Venus Express scientists have detected, for the first time, a tenuous layer of ozone in this planet's atmosphere. Located at an altitude of about 100 km, the layer is up to a thousand times less dense than the one found, at a lower altitude, in the Earth's stratosphere, but both are dominated by very similar chemical reactions. The discovery poses new challenges to the characterisation of planetary atmospheres, especially in the quest for biomarkers on extrasolar planets. Artist's impression of the night side of Venus, hihglighting the spots where ozone has been detected. Ozone (O3) is one of the most notable molecules populating the atmosphere of the Earth. Present there only in moderate quantities with respect to other, more abundant molecules—nitrogen, oxygen and carbon dioxide, among others—ozone plays an essential role in preserving life on Earth. Mostly concentrated in a dense layer in the stratosphere, at altitudes between 15 and 50 km, atmospheric ozone absorbs the most energetic ultraviolet photons from the Sun, those which are harmful to living organisms. By absorbing this radiation, ozone is also responsible for the temperature inversion in the stratosphere. The Earth's layer of ozone is a result of the large abundance of molecular oxygen (O2) in our planet's atmosphere. When irradiated by solar ultraviolet rays, oxygen molecules are broken into atoms, which may, in turn, react with other oxygen molecules and create ozone. These reactions also take place in the atmosphere of other planets, as long as they harbour sufficient amounts of molecular oxygen. In fact, traces of ozone were first detected forty years ago in the tenuous atmosphere of Mars. 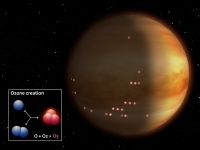 Until now no evidence of this molecule had been found in the atmosphere of Venus, in spite of theoretical predictions. At last, observations performed with one of the instruments on ESA's Venus Express spacecraft have now clearly identified a thin layer of ozone in the upper atmosphere of Venus. The results are reported in a paper published in the journal Icarus and are being presented at the European Planetology Network and Division for Planetary Sciences of the American Astronomical Society (EPSC-DPS) joint meeting, held this week in Nantes, France. "We were surveying the atmosphere of Venus and focussing on other molecules when we stumbled on a very interesting feature in one of the spectra," comments Franck Montmessin from the Laboratoire Atmosphères, Milieux, Observations Spatiales (LATMOS) in Guyancourt, France. Montmessin led the team who carried out this study. "The spectral signature of ozone, a distinctive absorption band at UV wavelengths, was rather pronounced and we could clearly discern it in our plots with the naked eye," he adds. Artist's impression of stellar occultation observations at Venus. The data have been gathered with the Spectroscopy for Investigation of Characteristics of the Atmosphere of Venus (SPICAV) instrument on board Venus Express using the stellar occultation method. This technique allows astronomers to indirectly probe a planet's atmosphere by studying its influence on the light from distant stars. "As it orbits Venus, the spacecraft's line of sight to a given star crosses the planet's atmosphere, meaning that starlight is prone to being absorbed by the atmosphere," explains co-author Jean-Loup Bertaux from LATMOS and Université de Versailles-Saint-Quentin, France. Bertaux is also the Principal investigator of SPICAV. "In the process, chemical species present in the atmosphere leave their characteristic signatures in the star's spectrum, enabling us to pinpoint them," he adds. After they identified this first ozone feature in the spectrum from an orbit of Venus Express, the team of astronomers ran a dedicated search over data from nearly 300 orbits. The analysis revealed robust evidence for this molecule in about ten per cent of the orbits. According to the new data, ozone is located at varying altitudes in the Venusian atmosphere, between 90 and 120 km, and is always confined to a rather thin layer, measuring 5 to 10 km across. "The varying altitude and narrow radial extent of the detected patches are particularly striking, hinting that an as-yet-undetermined mechanism must be keeping the ozone right there," notes Håkan Svedhem, ESA Venus Express Project Scientist. 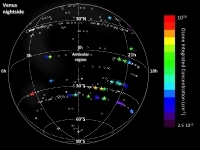 Map of the night side of Venus showing the ozone detections of SPICAV. The ozone layer on Venus is very tenuous—up to a thousand times less dense than that on Earth. Nonetheless, it could be readily detected using SPICAV because the stellar occultation method, by peering tangentially through the layers of the atmosphere, probes a large path of the atmosphere and is thus sensitive to chemical species even in low concentrations. A drawback of the method, however, is that it relies on the availability of stars in the line of sight, meaning that it yields an uneven coverage of the planet and is limited to the night side. This means that investigations of the spatial or temporal distribution of ozone across the planet are not straightforward. "Interestingly, we expected to detect ozone at the anti-solar point, where molecular oxygen is highly concentrated, but instead we found none there," comments Montmessin. As highlighted by previous studies based on Venus Express observations, sunlight illuminating the day side of the planet breaks apart the carbon dioxide molecules, liberating oxygen atoms. These are then carried to the anti-solar point, on the night side, by the sub-solar-to-anti-solar circulation, a strong wind caused by the high temperature gradient between the two sides of Venus. Oxygen atoms transported to the anti-solar point give rise to molecular oxygen, and some production of ozone is also expected. The transport of oxygen to Venus' anti-solar point. "The lack of ozone detected there is explained if the molecules are destroyed by chlorine-based compounds, which are funnelled to the anti-solar point by the same mechanism that draws the oxygen there," adds Montmessin. The chlorine-catalysed destruction of ozone at Venus' anti-solar point may be caused by reactions very similar to those responsible for the Antarctic 'ozone hole' on Earth, highlighting once again the similarity of atmospheric processes on these two planets. Besides enabling comparative studies among the atmospheres of terrestrial planets, this discovery has intriguing implications for astrobiology and the quest for extrasolar planets. Future hunts for planetary systems beyond our own will characterise the atmosphere of these planets in search of biomarkers—chemical compounds, such as water, carbon dioxide and molecular oxygen, that are associated, on Earth, with living organisms. Thus far, ozone has also been regarded as a potential biomarker, since it traces the distribution of molecular oxygen. However, the detection of ozone in the atmosphere of Venus, a planet that clearly does not host life, raises questions about the unambiguity of biomarkers and will help assessing the role of chemical indicators of biological activity in future extrasolar planet searches. The study presented here is based on data collected with the Spectroscopy for Investigation of Characteristics of the Atmosphere of Venus (SPICAV) instrument on board ESA's Venus Express spacecraft. SPICAV is a remote-sensing spectrometer covering three distinct spectral regions (ultraviolet, near- and mid-infrared). 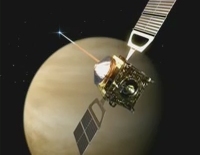 It is used to probe the atmosphere of Venus above the clouds, which are located at an altitude of about 50–60 km. Venus Express, Europe's first mission to Earth's twin world, is investigating the nature of our closest planetary neighbour. Launched from the Baikonur Cosmodrome in Kazakhstan on 9 November 2005 upon a Soyuz-Fregat launcher, it was inserted into Venus orbit on 11 April 2006, and is currently the only spacecraft in orbit around the planet.